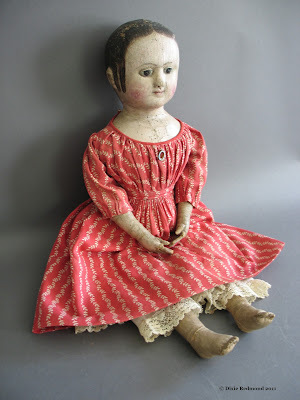 Hi, Folks - I gave this free pattern a while ago on my Northdixie Designs blog to use in making a small Izannah Walker doll, so I thought I would put it here to share as well. 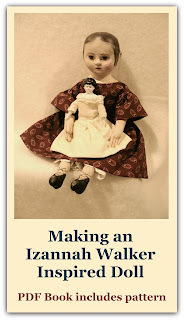 I used this pattern for the Izannah Walker doll I made pictured above. I added paper clay on top of the head and shoulders. Finished, it made up a doll was around 15" tall, depending on how you attach limbs, etc. I've become better at dressmaking since I made this doll. It's still one of my favorites. updated version of this free pattern. Thank you for so generously sharing this pattern. I think your dolls are beautiful. Thanks so much for sharing this pattern. 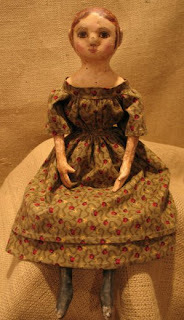 I have been making primitive dolls for just over a year, but have been a quilter for many years. The anticipation for this finish doll greatly excites me! Your dolls are amazing!